Kansas City, MO. 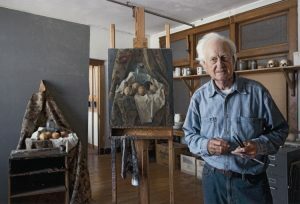 July 31, 2018–Wilbur Niewald’s decades-long career as an artist is celebrated at The Nelson-Atkins Museum of Art in Kansas City with the exhibition In the Studio, opening Aug. 8. 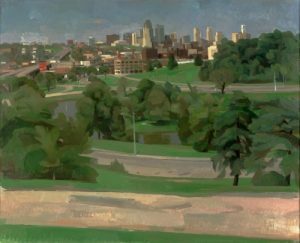 The native Kansas Citian’s classically beautiful landscapes of Loose Park and the West Bottoms have been shown at New York’s Metropolitan Museum of Art and the Nelson-Atkins; his works are included in numerous public and private collections. In the Studio with Wilbur Niewald captures the scope of Niewald’s career, from abstract to representational. The exhibition encompasses paintings from the 1950s to the present, with works from the Nelson-Atkins and private collections as well as Niewald’s personal collection. In the Studio will be installed within the Bloch Galleries, adjacent to works by artists who heavily influenced Niewald’s subjects and styles. Niewald taught painting and drawing at the Kansas City Art Institute for 43 years, chaired the painting department, and received the prestigious Guggenheim Memorial Foundation Fellowship in 2006. Niewald cites Paul Cezanne, Alberto Giacometti and Piet Mondrian as key influences. The Mondrian influence is most apparent in Niewald’s abstracts of the 1950s and 60s, with simple vertical and horizontal lines with a simple palette of yellow ochre, burnt sienna, black, and white. While his early work was largely abstract, in the late1960s he began to paint more representationally. Niewald grew up near Swope Park and was selected by teachers as a student who had artistic potential. He went to KCAI each Saturday and received a scholarship to attend the school at age 17, but WWII intervened and he left to serve the Navy Air Corps. Following the service, he did attend KCAI and received his Bachelor’s and Master’s degrees before embarking on his career teaching drawing and painting. He retired from KCAI in 1992. The artist will lead two tours of the exhibition; Thursday, Sept. 27 from 6–7 p.m., and Sunday, Oct. 21 2–3 p.m. In the Studio with Wilbur Niewald closes Nov. 4. In November, The Nerman Museum will present Wilbur Niewald In the Landscape, an exhibition of recent watercolors. Image captions: E. G. Schempf, American (born 1948). Wilbur Niewald, 2009. Chromogenic print, Image: 10 7/8 x 16 inches, Sheet: 16 1/8 x 20 1/4 inches. The Nelson-Atkins Museum of Art, Kansas City, Missouri. Gift of the artist, 2010.28. Wilbur Niewald, American (b. 1925). Kansas City, View from Penn Valley Park, 1989. Oil on canvas, 29 3/4 x 36 3/4 x 1 5/8 in. The Nelson-Atkins Museum of Art, Kansas City, Missouri. Purchase: Nelson Gallery Foundation, F90-14/2.